MacBook owners that find their cables become tangled whilst in the bottom of their bags might be interested in a new gadget called the Hula Wrap, which has been created to help keep your MacBook cables organised and tangle free. 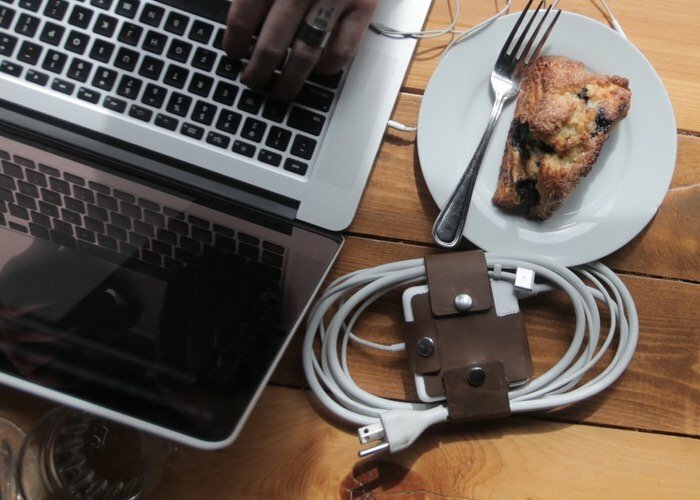 The leather cable organiser has been designed to look after both your Mac cables and your MacBook charger keeping them all safe from damage and ready to use when you need them most. Watch the video below to learn more about the Hula Wrap which is now available to back via Kickstarter with pledges starting from just $20. Hula is a sleek and simple way to organize the cables on your macbook charger. We made Hula because we needed it. It started out as a solution for ourselves, but then we realized that other people might want it too. If you use a macbook, then you know the pain of trying to pack up the charger. Almost every macbook user uses the long extension cable for the charger, but there is no great way to keep the cable organized. The Hula is designed for you to easily wrap up your cables however you like them. Wrap up the MagSafe cable alone or, if you’re in a hurry, wrap them up together. The leather pouch allows you to use the MagSafe organizing tabs as well as swap out your AC extension cable with a AC wall adapter. Made in the USA with genuine leather, the Hula is the kind of product that will wear-in rather than wear-out. Macbook chargers come in 3 sizes; 45W, 60W, and 85W. We will send out a survey at the end of the campaign for you to specify which size you need. For more information on the new Hula Wrap jump over to the Kickstarter website for details via the link below.